Congratulations to all who participated in this year's competition! Read the press release. Watch the Dallas/Fort Worth NBC channel's story on the winning team! Thank you to Nabil Kapasi, Academic WorldQuest alumnus, for giving the keynote speech at this year's National Competition. Watch the video. See USIP's photo album 1 and photo album 2 of its Friday, April 27 reception. The Carlos and Malú Alvarez Academic WorldQuest National Competition honors the tremendous dedication and philanthropic support of WACA National Board member Carlos Alvarez and his wife to our flagship program and the Academic WorldQuest Endowment Fund. The national competition is attended by more than 225 of the nation's most promising high school students annually, along with their parents, teachers, and chaperones. The AWQ competition is a unique opportunity for many students to visit the nation's capital for the first time. 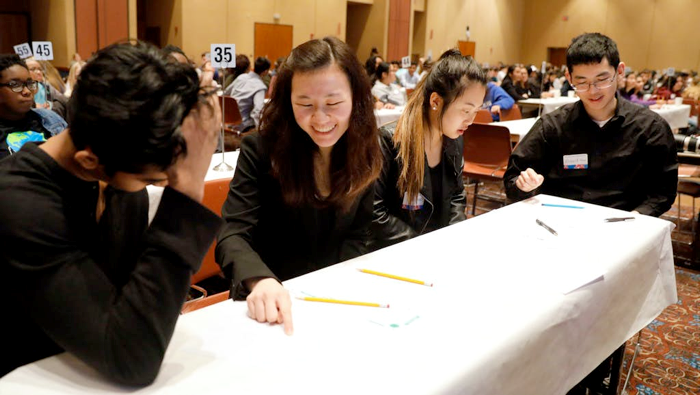 The Carlos and Malú Alvarez 2018 Academic WorldQuest National Competition was held on Saturday, April 28, from 8:00 AM to 12:00 PM. Location: National Press Club, 529 14th St. NW, Washington, DC 20045. See the 2018 Program Schedule. This year's National Competition featured a welcome reception at the United States Institute of Peace on Friday, April 27, from 4:00-6:00 PM. At the opening reception, Academic WorldQuest participants had the opportunity to explore the many ways that the United States Institute of Peace works to prevent conflicts from turning to bloodshed and to end it when they do. This includes the opportunity to hear from Ambassador William Taylor, USIP’s Executive Vice President, and Maria Stephan, Director of Nonviolent Action Programs at the Institute. USIP also sponsored "The Peacebuilding Toolkit" category of the competition. Note: you may find the Environmental Performance Index source file here. The World Affairs Councils of America arranged a group hotel block at the Washington Marriott Wardman Park (2660 Woodley Road NW, Washington, DC 20008). The reservation block has now closed. Local AWQ competition dates and results are listed here. Academic WorldQuest, a flagship program of the World Affairs Councils of America that engages more than 4,000 high school students annually across the U.S. to test their knowledge of global issues and foreign policy, has received a $500,000 contribution from a generous supporter. Carlos Alvarez of San Antonio, Texas, a businessman and philanthropist who serves on the WACA National Board of Directors, made the donation as part of the nonprofit organization’s campaign to endow the Academic WorldQuest national competition. He is making the gift with his wife, Malú – the gift would be the largest to date for any World Affairs Councils of America fundraising initiative. “Mr. and Mrs. Alvarez’s generosity is an inspiring affirmation of the purpose of Academic WorldQuest – to offer young people a fun and interactive way to learn about critical challenges facing the U.S. and the world – and their gift will enable WACA to sustain and expand the Academic WorldQuest national competition while enhancing support for educational programs provided by 96 local nonprofit World Affairs Councils,” says Bill Clifford, WACA President and CEO. “They truly understand the value of educating and engaging the public, and especially students, in international affairs and we are incredibly grateful for their commitment." Please Note: The Great Decisions 2017 Briefing Book is required study material for the National Competition. However, the Briefing Book is NOT be required reading for local competitions. In order to prepare for local competitions, students should study the online resources outlined in the Study Guide. Please use these flyers to promote the Academic WorldQuest program to teachers, students, and sponsors: Teachers Guide and Flyer. To learn more information about hosting your own local AWQ competition, please read WACA's 2018 Operations Paper.